Sunlight dances through the trees surrounding this cozy log cabin. High on a forested mountainside, you will find a peaceful getaway that is convenient to all the Great Smoky Mountains have to offer. Tucked away in the trees, Sundance at Deep Creek has everything you need for a peaceful getaway. Convenient both to downtown Bryson City and just a 3 minute drive to the Deep Creek area of the Great Smoky Mountains National Park, this cabin is close to your favorite outdoor adventures - fishing, waterfall hikes, and mountain biking. Stand up paddle boarding on the Tuckaseegee River is less than a ten minute drive. 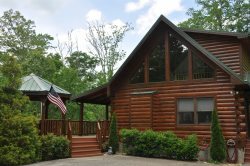 With two private bedrooms and two full baths, this fully stocked mountain cabin is minutes from all the best loved attractions in the Smoky Mountains. Each bedroom has a queen size bed. The high windows in the living room and vaulted ceiling lets mountain sunshine in. Stocked with the comforts of home, Sundance at Deep Creek has a full kitchen, wireless internet, and washer and dryer. Relax in the hot tub and let your cares drift away as the stars shine above by night. By day the bird song and wind whispering through the trees will serenade you. Kick back in the rocking chairs, or enjoy your meals al fresco with the picnic table and gas grill. Deep Creek in the Great Smoky Mountains National Park is about a mile from the cabin with three gorgeous waterfalls and a variety of hiking trails. The train depot for the Great Smoky Mountains Railroad is less than a 10 minute drive. Find restaurants, concerts, and more at Harrahs Cherokee Casino – just 25 minutes from the cabin. Kayaking on Fontana Lake is about a 20 minute drive. For more guest testimonials, please click on the Reviews tab. 2 Bedrooms and 2 Baths: The main floor bedroom has a Queen Bed and private bath. The upstairs bedroom with Queen Bed and Private Bath.Both bathrooms have tub and shower combinations. Wonderful! Everything was made easy and helped for a relaxing weekend. Beautiful views, hot tub was amazing and enjoyed the wild turkeys. Overall a restful pleasant stay. Really appreciated the seclusion and quiet. The team at GSCR was excellent. We went hiking and visited the park. We enjoyed our vacation, loved the view! We went hiking, visited Hiking, the national park and went on Great Smoky Mountain Railroad. Very clean, everything we needed for our stay was provided, staff was great, they made sure we were good! Enjoyed every part of this cabin, the beautiful view, the relaxing hot tub and cozy cabin! We hiked to the falls and loved Bryson City! This was a well-maintained property. I appreciated the guidebook that included ample information about local attractions and activities. We loved the quality of furnishings/layout/amenities and location. We did a lot of hiking in the area. Our stay was awesome!! The cabin was just as we expected and it was clean. The view was beautiful as well. The team was awesome and very friendly. They even called to let us know that they were doing road work on our road. They were very accommodating. Our favorite was the balcony and the kids loved the hot tub! Wonderful cabin and amazing views! Loved being in the woods. Perfect place for our needs. Hope to be back. Great experience! No problems. GSCR is well organized and great communication. Wonderful cabin with a great view. Hot tub was a real plus and a delight to soak in after a long day out hiking and exploring. Cabin was secluded in the woods but close to Bryson City. We recommend this place and hope to return! It was an easy check in and was never told something that didnt happen. It was everything and more than I expected. Im happy I live close enough to definitely book this cabin again. Thanks for the hospitality. We rented for Fathers Day last second and honestly had the most relaxing time. It was affordable and with all that said we will be back! Maybe this weekend!!! The view from the Sundance cabin is one of the best we seen. It was just my husband and I so it fit our needs fine. The wildlife is abundant. And my husband can finally check off his Smoky Mountain bucket list of seeing a bear. We enjoyed the evening sunsets and would not come inside until the last little bit of light was left. Sundance at Deep Creek was great, the view was outstanding. It had everything we needed. We would stay there again. Everyone I spoke to at Great Smokys Cabins Rentals was great. Friendly and answered all my question. We really enjoyed this cabin and the views. We also enjoyed the Hot Tub and rocking chair. The location was great. Very peaceful. Our dog also enjoyed. The trails and hiking were beautiful. Very beautiful location, we loved the hot tub. Beautiful view! This cabin had everything we needed for just the three of us, so much so that I over packed on paper products. We truly enjoyed our stay! Location was very close to Bryson City and was right at the entrance to Deep Creek for some easy mountain hiking. Definitely heed the advice of the host and arrive before dark. The road to get to the cabin is very narrow and our biggest concern was meeting another vehicle trying to travel down as we traveled up and vice versa. No where to pull off if that happened in certain sections! Thank you, Thank you!! These have been the best 5 days in many years. Great location. I hope that we will be back again one day to this same cabin. The view, was well no words can explain. Thank you! These have been the best 5 days in many years! We thank you all. Great location! We will be back one day to this same cabin. The view...no words can explain it! Kelli was responsive to our fireplace request. Our week in Bryson City are always goes to fast. We hiked and tubed and rafted and just sat by the water and enjoyed family time. Beautiful views accompanied our morning coffee from this cabin. We loved our escape from the heat and humidity at home.